The Electrical Oil Service (EOS) article has been published in the Transformer Magazine edition No 2 2018. To read the full article, please click on “EOS Closed-Loop-Model for Transformer Oil Regeneration”. The reliable performance of a transformer depends upon certain basic insulating oil characteristics. In order to accomplish its multiple roles of dielectric, coolant and arc-quencher, the oil needs to possess certain properties in particular high dielectric strength, sufficiently low viscosity, adequate low-temperature properties and resistance to oxidation. In service, mineral oil degrades due to the conditions of use. In many applications, insulating oil is in contact with air and is therefore subject to oxidation. Elevated temperatures accelerate degradation. The presence of metals, organo-metallic compounds or both may act as a catalyst for oxidation. Changes in colour, the formation of acidic compounds and, at an advanced stage of oxidation, precipitation of sludge may occur. Dielectric and in extreme cases, thermal properties may be impaired and the transformer could fail. The Directive 2008/98/EC on Waste (Waste Framework Directive), ISO 14001 (Environment) and Waste Hierarchy obligations now necessitate waste management and the options of recycling or treating insulating oils. As a leading supplier of both regenerated and unused electrical insulating oils and associated services, EOS offers a “closed-loop”-model to the market. It allows used transformer oil (UTO) to be regenerated to as-new oil quality and re-used on a sustainable basis. For simplicity, all used insulating oil coming out of a transformer, tap changer or switchgear can be referred to as UTO. The EOS “closed-loop”-model is based on high quality control instruments and systems to comply with the British BS148:2009 standard for “reclaimed oils” and meet the performance requirements of IEC 60296 for “as new properties oil”. The latter can only be achieved with additional process steps at the EOS plant. It is estimated that approximately 18,000mt of UTO was generated in the UK in 2016. Similar volumes are generated in Germany, France and Benelux which could be regenerated either on a static facility or on-site with the mobile units available. 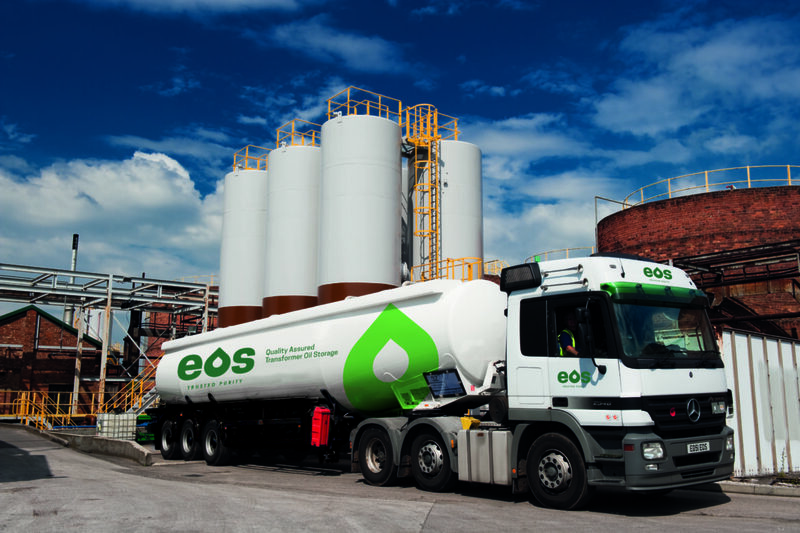 As part of the EOS service package, the UTO is collected at customers’ sites in containers ranging from 25 or 210 litre drums, 1,000 litre IBCs or bulk tankers from 3,000 to 30,000 litres. To reduce the carbon footprint, in most cases a Regenerated Transformer Oil (RTO) is delivered at the same time as the UTO collection is made. The reclamation requires a Waste Transfer or Consignment Note (for hazardous waste) besides an efficient and well-managed logistic and transport infrastructure. “The main reason for the segregation process is to obtain a uniform and good quality UTO feedstock and prevent damage to the bauxite in the regeneration columns”, explains Tom Larney. The UTO is first settled in large tanks and eventually finds its way into the regeneration plant consisting of columns of bauxite (aluminium oxide). Bauxite is a very efficient “adsorbent” and polar contaminants in the UTO – acids, sludges and other contaminants “stick” to the outside of the bauxite material. After a pre-determined time columns of bauxite are “reactivated” using a controlled burning process. Reactivated bauxite then continues to be used and is eventually replaced, in some cases, after 200 reactivations. Once the oil has passed through the bauxite columns it is fed into a large batch tank for in-house compliance testing according to BS148:2009. This process takes about one week. Batches are then sent to 50,000 litre final product tanks which following drying and filtering contain RTO at <10ppm water and BDV of >85kV for feeding the drumming line or road tankers. Not all sulphur compounds are bad in transformer oils. Some, such as thiophenes and disulphides, are not only stable, but actually recognised by uninhibited oil proponents as having good natural antioxidant properties. These may also act as metal passivators and deactivators reducing the catalytic effect on oil oxidation in transformers. The good sulphur content in the UTO pool averages 1,300ppm (mg/kg) which maintains a high level of oxidation stability. The nature of centralised “closed-loop” regeneration means that diverse and in the main, good quality feedstock can be segregated and used to produce an uninhibited regenerated oil with excellent oxidation stability characteristics. When returned to service in a transformer, the RTO can resist oxidation from heat and oxygen combinations. Graph 1 shows the acidity neutralisation results from collected UTO over five years. A combination of high volumes of oil demonstrates that the UTO retains much of its “natural” anti-oxidation components. Artificial inhibitors to restore the oil’s characteristics are therefore not required in most cases. The RTO corresponds to the requirements of BS148:2009 and is widely used in transformers and switchgear by all UK Distribution Network Operators. In recent years, significant investments have been made at the EOS production site to enhance further the quality of regenerated oil to meet increasingly strict demands. One major enhancement was achieved with the installation of a bespoke and unique dehalogenation plant. This plant allows the “traditional” regenerated oil according to BS148:2009 to be further processed into a High Grade RTO which meets all the performance requirements of unused oil according to the IEC60296:2012 standard and a potential future single IEC 60296 standard for all mineral insulating oils. EOS High Grade, available in both uninhibited and inhibited options, is a significant advance in regenerated insulating oils, giving the asset manager and maintenance company owner the best quality of regenerated mineral insulating oil on a sustainable basis, with both economic and environmental advantages. With the pressure to make distribution transformers last longer than their 15-20 years expected life, and to meet all legal and other environmental requirements, electricity utilities work closely with EOS engineers to achieve their goals. The advantages of regenerated oil are more and more widely acknowledged, and it has become a viable option for many utilities and industrial asset managers. From a review of the feedstock and the quality of RTO which can be produced to BS 148:2009 or even IEC 60296 standards, it is evident that the quality controls and effectiveness of the regeneration process are critical elements. “We are convinced that our “closed-loop” model to collect UTO and the production of high insulating oil quality is an environmentally-sound and cost-efficient alternative to new unused insulating oil for Sustconsideration by all asset managers and engineers in Europe”, concludes Tom Larney. Regeneration is defined as the restoration of oil to a useful state by the removal of contaminants and products of degradation such as polar, acidic, or colloidal materials from used electrical insulating liquids by chemical or adsorbent means. Typical adsorbents are clay (Fuller’s Earth), activated alumina (bauxite), attapulgite and molecular sieves. British Standard (BS) 148:2009 for “Reclaimed mineral insulating oil for transformers and switchgear – Specification” is currently the published standard. In most aspects it corresponds to the unused oil standard IEC 60296:2012. The main differences are in colour and oxidation stability. PCB content in regenerated insulating oil can now be reduced with modern technology to non-detectable (<2ppm) levels and is becoming less of a concern amongst users. The IEC is currently reviewing the IEC 60296:2012 standard to include regenerated oils into a single new standard. For more Information on the Transformer Magazine, please click here. Electrical Oil Services (EOS) is a key brand of HCS Group GmbH and a leading supplier of unused and reclaimed insulating oils and associated services in Great Britain and continental Europe. EOS specialists have 60 years’ experience in the production and marketing of insulating oils and supply both large and small customers in the electricity distribution industry with tailor-made solutions. The production site in Stanlow is a self-contained 12 acre site, with 2,000 m² of warehouse, manufacturing and office buildings as well as 60 storage tanks, ranging from 50 m³ to 3,000 m³.